Small, yet passionate. New here? Welcome! Browse our topics + pages or learn more about us. Want to connect? I'm always ready to make new friends. WDW Central is always open to awesome guest posts. #18YUM. 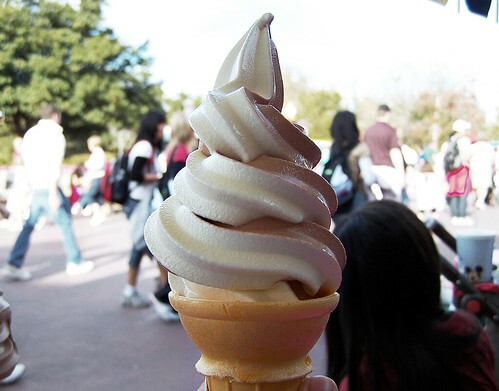 Just look at that ice cream cone. It’s wet coolness is just glistening in the hot sunlight. The instant you put your tongue on that it will be an absolute paradise. All your troubles will slip away. What’s even better than simply having some of those delicious Disney desserts you ask? Simple – getting them for free. If you go to Disney parks on your birthday (and are wearing that infamous pin), it’s true. Not only will you hear “Happy Birthday!” one hundred times, but maybe – just maybe you’ll get some special surprises. More common if you go into sit-down restaurants, the waiter will bring you a complimentary dessert on your birthday. So sit back, relax, and enjoy the sweet treats as you eat yourself into bliss. This also happens quite a bit when you get married! My husband and I just got back and I think we got free desert at every restaurant (express or sit-down)! It was fantastic! Coming Soon On Youtube Are Summer in 2013.